Author, "Now I Sit Me Down: From Klismos to Plastic Chair, A Natural History"
The Iron Throne in Game of Thrones is forged from 200 swords. It resembles a spiky—and spooky—peacock. It looks distinctly uncomfortable. But then, comfort is not the point of a throne, which is a symbol of power and only incidentally a seat. A ruler is said to “ascend to the throne” “usurp the throne,” or even “be toppled from the throne.” But the one thing that’s hard to imagine is a ruler being upstaged by a throne, which is the case with the Iron Throne. It’s melodramatic and over-the-top theatrical; a gamer’s idea of a seat of power, all adolescent bluster and visual bombast. Real seats of power are not so ostentatious. Consider the throne of Charlemagne, who ruled over most of medieval Western Europe. The throne is in the Palatine chapel of the Aachen Cathedral. At first glance, it looks like something you might find in IKEA—except that instead of particle board, it’s made out of four thin slabs of marble held together by bronze clamps. No ordinary marble, the material is from the Church of the Holy Sepulchre in Jerusalem. The seat was reached by climbing six steps, a conscious reference to the throne of King Solomon, which likewise reinforced the Holy Roman Emperor’s claim to spiritual rulership. A final and delicious piece of symbolism: the platform on which the chair stands is supported on four short pillars, and his subjects could show their fealty to the emperor by crawling beneath the throne on all fours. One thing that the Iron Throne does get right: It has a backstory. The throne was forged from the swords of long-ago defeated enemies. Indeed, thrones frequently derive their magical potency from ancient roots. For centuries, Scottish kings were crowned seated on the Stone of Scone (kept in Scone Abbey), an oblong block of red sandstone that, according to legend, was brought from Ireland by Saint Columba. In 1296, Edward I—Edward Longshanks, the villain in Braveheart—stole the stone and installed it in Westminster Abbey, where it became part of what is known as the Coronation Chair. The ancient Stone of Scone beneath the Coronation Chair in London’s Westminster Abbey. 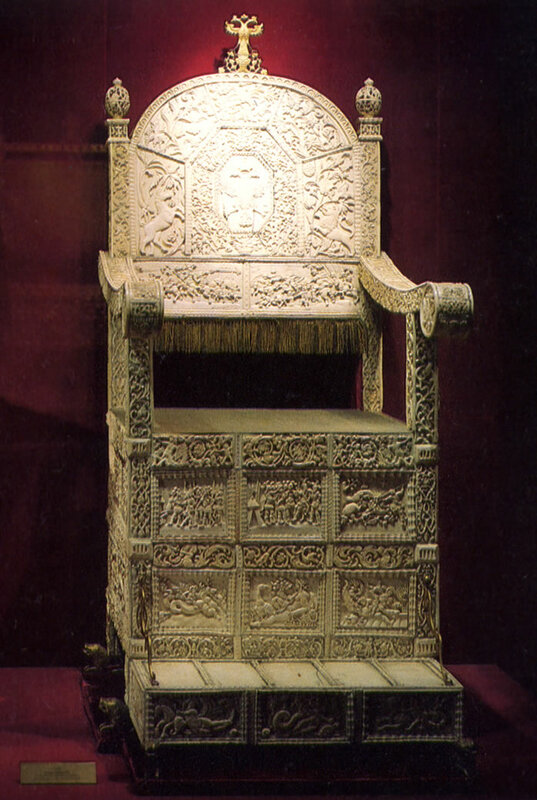 This throne is a high-backed thirteenth-century armchair, Gothic in style and made of oak; unexceptional except that it encloses a 300-pound chunk of sandstone beneath its flat seat. The symbolism is unmistakeable, which is why Scottish nationalists briefly repatriated the stone in 1950; the British officially returned the stone to Scotland in 1996. The Iron Throne also seeks to create fear and subjugation through heavy-handed symbolism. But dread can be instilled more successfully by other means. The throne of Ivan the Terrible is an example. It was brought to Russia by Ivan’s grandmother, a Byzantine princess. The wooden armchair is modestly proportioned and slightly raised with a footrest. Its distinction comes from the fact that it is covered in panels of carved ivory. The bas-relief panels depict mythological, heraldic, and Biblical scenes, including King David, Ivan’s favorite. The Tsar of All the Russias was a fearsome figure, a despotic ruler who by all accounts was prone to episodic outbreaks of mental instability. Seeing him seated on this rather delicate white wedding cake of a chair would have made him seem terrible indeed. Ideas, design, ST, Thought Leaders, "Game of Thrones"